During the 1950s, Michael Potter, at the National Cancer Institute of the National Institutes of Health, perfected a technique for growing plasma cell tumors (plasmacytomas) in mice that produced highly specific antibody molecules in response to specific antigens. Potter freely shared these mouse plasma cells with scientists around the world, including Cesar Milstein and Georges Köhler at the Laboratory of Molecular Biology in Cambridge, England. In 1975, Milstein, a biochemist born in Argentina and a naturalized British citizen, and Köhler, a German postdoctoral fellow, fused mouse spleen cells, a rich source of beta-lymphocytes from the plasmacytomas, and mouse myeloma cells to produce hybridomas. These hybridomas produce monoclonal antibodies, or antibodies that are identical to one another because they are produced by one type of immune cell type; moreover, they can be produced in an unlimited supply. The development of monoclonal antibodies is considered one of the most significant advances in biomedical research in the twentieth century, earning Nobel Prizes for Milstein and Köhler in 1984. Milstein did not seek patent protection for his technique, causing major reverberations at the highest levels of the British government. It was predicted that monoclonal antibodies would have a wide range of therapeutic uses, be safe and highly selective in their effects, and be easy to manufacture. As of June 2014, thirty monoclonal antibody-derived products had been approved by the US Food and Drug Administration for the treatment of cancers, autoimmune diseases, inflammatory disorders, and as diagnostic agents. SEE ALSO: Adaptive Immunity (1897), Ehrlich’s Side-Chain Theory (1897). 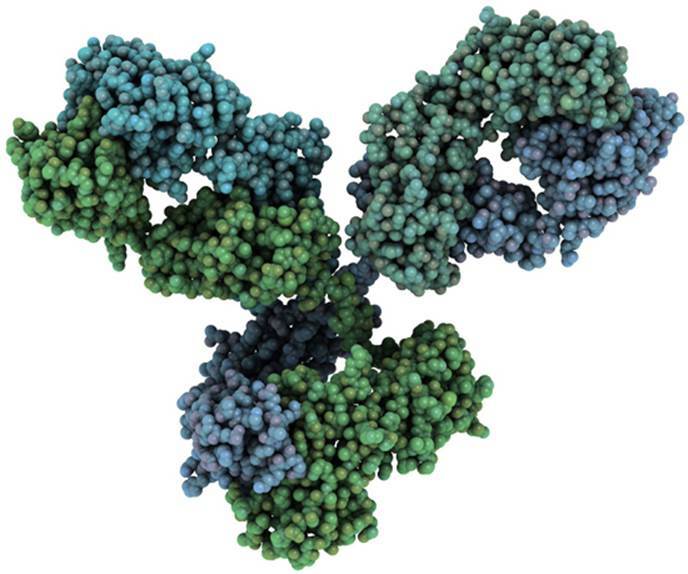 The depicted monoclonal antibody (mAb) is an immunoglobulin G (IgG) molecule, the most abundant class of antibodies found in the blood and lymph.